Dolphin Bar and Café have made the decision to end the confusion between their bar and Dolphin Bungalows on the beach. They continue to receive emails addressed to Dolphin Bungalows. Visitors looking to book a bungalow online are confused. This is because Dolphin Bungalows have never bothered with a website. It was only last year they bothered to tell anyone their email address. The solution has been for Dolphin Bar and Café in Yai village to rename. 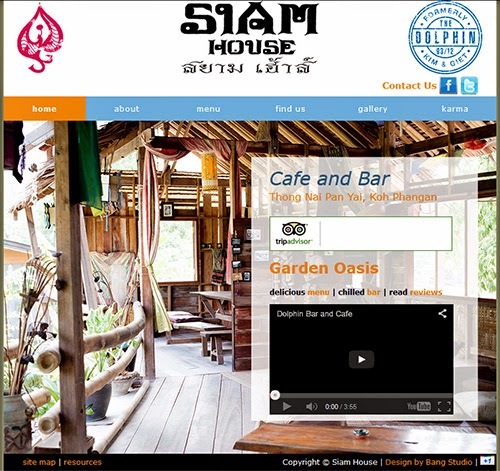 It is now Siam House. However, for the time being they are still reminding people that they were formerly known as ‘Dolphin Bar and Café’. This is because they have numerous glowing reviews on Trip Advisor under their old name. It takes a while to change these things. The website address www.dolphinbarandcafe.com has been kept but the website has been completely changed. The header shows the new name but also explains that the place was once called ‘Dolphin Bar and Café’. It is hoped that over time the new name will stick, the TA reviews will be updated and that the website will move to a new address. Then the confusion will finish. As an aside, the new look website is particularly cool. It uses great photos taken by Myscha Oreo and has a stylish and easy to navigate feel. A big improvement on the last website design. It is expected that the original and funky Siam House will go from strength to strength as visitors to Thong Nai Pan now have greater expectations. Accommodation prices have increased and people now want something more than the standard Thai / Western menu. They are looking for places with a bit of originality and good customer service. The days of just opening up a basic business on or near the beach and watching the money roll in are going. Those who ignore review sites do so at their peril.